Soon my wife and I will be coming up on nine years of marriage. And, I’m finding that we don’t always have to be going somewhere or spending a lot of money to enjoy each others company. In fact, some of the best times I’ve had with her haven’t involved doing anything extravagant. I’m sure you’ve found this too in your own relationships. Although we had to pay for gas – one day my wife and I went and visited her grandma and grandpa’s old farm where she spent some memorable parts of her childhood at. Fortunately enough – the current resident was game for the idea and gave us a grand tour of the house and property. It was a memorable time and one that didn’t cost much. 6 Count all of the jobs you’ve had. Or roommates you’ve had. Or..
On the weekends, my wife and I do a fair amount of reading together. I mainly read to her (probably because she loves my deep voice so much – ha!) – but we get a lot of free books that I check out through the library via my Kindle. One of the things I’ve been meaning to do is to read a few of our favorite children books together. Two of my favorite books include, “Here Comes the Strikeout” and “The Little Engine that Could“. While my wife is a fan of the Dr. Seuss books. I’m sure many of your parents saved a bunch of photos from years past and threw ’em in an album or large box. My mother did this – and it’s great to go back to them now and then. This is especially something fun to do with a spouse (not to mention your children). If you wanted to make some work out of it – try scanning them in and digitizing / organizing them (okay, maybe I carried that one a little too far). Okay – so this will likely cost the price of a canvas and some paints – but a fun activity to do together is to do a painting together. Even if you aren’t artists – it is neat to see what you both come up and and can help you explore your creative side. I’m a bit of an explorer at heart – so I always enjoy a good car ride and a chance to see some different scenery. One thing you can do is to check out a nearby town/city and then just go for a walk there. Perhaps you can walk through the downtown or nearby park? This is a fun way to add some excitement to your grocery shopping trips. When you are there – split up for about 5 or 10 minutes. The person who finds the cheapest item in the grocery store and then brings it back to a designated location after the time limit is up – gets immunity from doing the dishes that night (or whatever your least favorite chore may be). Count all of the jobs you’ve had. Or roommates you’ve had. Or.. This is kind of a fun conversational thing to do together. One afternoon my wife and I did this – and it took us awhile to list all of the jobs we’d had. It can also be a way to learn more about each other. Our library offers free access to HertiageQuest.com – a great online resource to look up your ancestors – as you can page through old census logs and other genealogy records. When you find the old handwritten census log of your great grandparents or other relatives – they are often high enough resolution that you can print them out and frame ’em (but that’s another activity for a later time). Guys – this is a good one for you to do for your lady. She’ll love it – but it will take some time and planning. You can write-up a set of clues to particular locations in your neighborhood (or in the city) and then plant different items at each locale. Then one afternoon, see if your wife can “solve” the treasure hunt. Preferably she finds a little something – like flowers or what have you – at the last location. In lieu of some days we can’t make it to church – my wife and I have been going through a bible study together. It isn’t anything too intimidating – but it connects us with the Lord and centers our life on the “main thing”. With Windows MovieMaker and your own smartphone or digital camera – you can create videos pretty easily today. While I wouldn’t be as game to do this one – maybe you want to create your own music video or a montage of old photos when you were younger. Put music to it – and viola! There are lots of creative and unique ways to spend with your loved one! 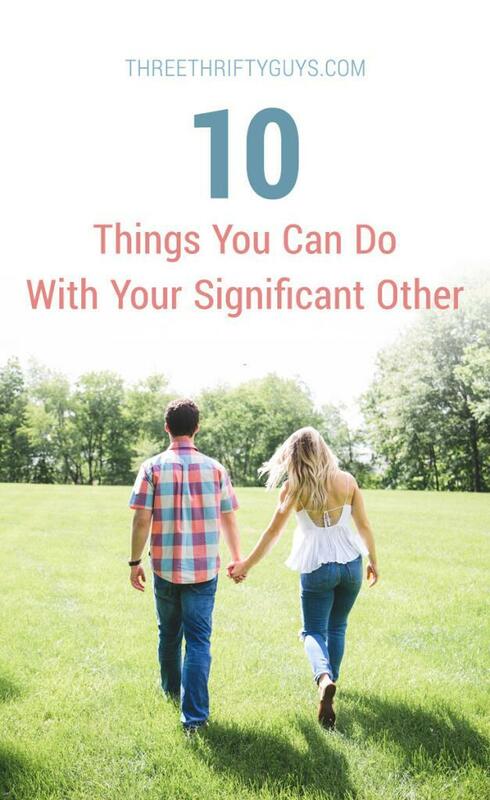 I’d love to know some of the thrifty ways you’ve found to spend with your significant other! You and your spouse can save on your cell phone coverage. Here is a comparison of some of the MVNO plans out there to help. Are Your Financial Decisions Creating More or Less Stress? All good ideas. We basically hang out together both in play and work but we have times when we are separate too. We walk or bike daily together even in when it gets to 0F in winter or 90+ in summer. If you dress properly weather is not a problem. We just talk and laugh like we’ve done throughout are 34 years of marriage. We aren’t retired yet but try to live each day to the fullest. Our totally favorite thing is riding our tandem bike. Probably put on about 1,000 miles a year. Excellent thoughts KG. Some of the best times I’ve had with my wife have been outside in some pretty cold temps too. Bundle up! Great ideas, Aaron! It would be fun to talk about some of these things in front of our kids as well, such as favorite childhood books and all the jobs we’ve had. Think I did a quick count of all the jobs I’ve had at one point and it almost hit 20! Haha.. kinda fun to do. I moved the furniture from in front of our new large screen tv and spread a beach blanket on the floor; Placed a couple of beach chairs with towels over the backs, then made a steak and potato dinner for 2 placing them next to each chair. When my husband arrived at the door from work, I switched on a YOutube video on the tv showing rolling waves on a beautiful beach with soft background music. The look on his face was priceless and we had a great dinner together! Have a great tax deduction by donating the car or truck to nonprofit. My husband likes cooking so we spend half of the evenings inventing new recipes. I like blowing bubbles so going into the backyard and having a laugh with bubbles for 10 minutes is something I’m always up for when it’s nice outside. We have a spring breeze today, and it’s a perfect day to fly a kite. We bought one as a souvenir a few years back, and take it out once in a while for a date afternoon. Wherever we go, we people watch and make up stories about the folks we see. We come up with some funny stories! The idea from your blog is to communicate with each other that we are doing this TOGETHER and we enjoy each other’s company. That makes it a date any day of the week. GOod ideas, Aaron. My husband and I love to sit on our back porch and watch the sunset. We do buy a nice bottle of wine and we also have dinner outside, that we make, but it is really enjoyable and something to do that is fun and doesn’t cost too much. A friend of mine owns an art gallery and my wife and I used the space for our wedding reception. We decorated the place with sculptures, poetry, and paintings made by our friends. We also included some of our own paintings and even though we’re not artists, we had a lot of fun doing them together. This was five years ago and we still have the paintings we made hanging in our home today. Also, the treasure hunt is a great idea. I put together a treasure hunt for my wife and our friends on her birthday and everyone got really into it. She says it’s one of the best birthday parties she’s had. @Ruser – Oh, clever idea!